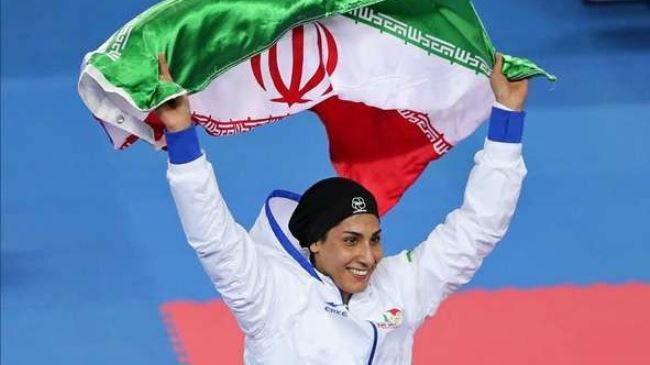 Hamideh Abbasali is the first Iranian women to receive a medal at a Karate World Championship, collecting a silver medal after conceding (2-1) defeat to her Egyptian opponent Shymaa Abouel Yazed in the final competition of the women’s over 68-kilogram weight division. Abbasali had overpowered Belgian, Spanish, Dutch and Hungarian contestants in her march to the final. 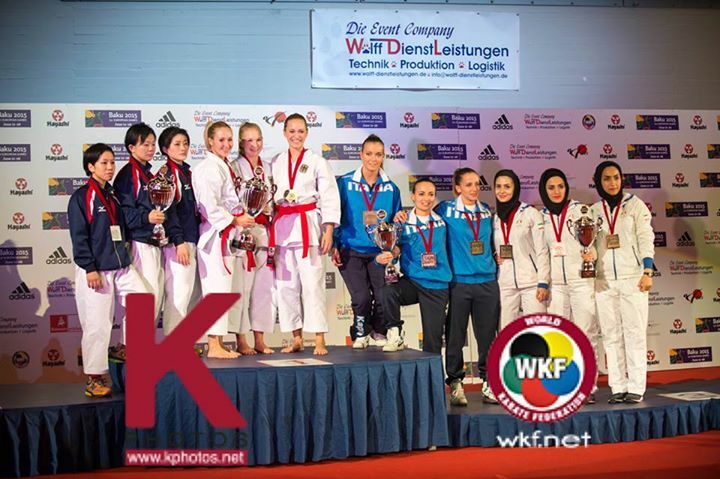 Separately, Mahsa Afsaneh, Elnaz Taghipour and Najmeh Qazizadeh won the third-place women’s kata contest on Saturday and brought home the bronze. The Iranian men athletes were also very successful. 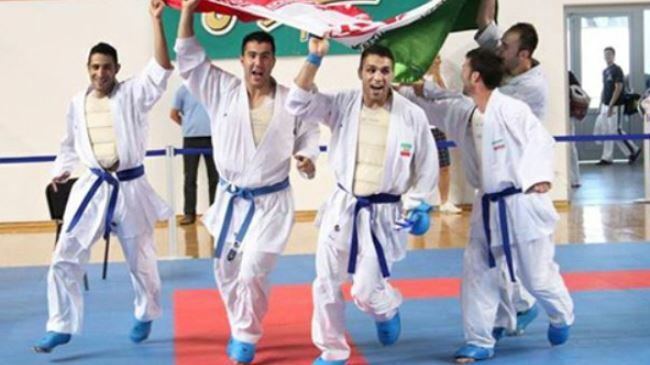 The Iranian men’s kumite team comprised of Saeed Ahmadi, Iman Sanchouli, Saman Heydari, Zabihollah Poursheib, Ebrahim Hasanbeigi, Sajjad Ganjzadeh and Bahman Asgari overcame the host nation 3-2 in the final round of men’s kumite contests at OVB-Arena in the northern German city of Bremen to clinch the gold medal. They had earlier defeated Dominica (2-1), Japan (3-1), Serbia (3-0) and Belarus (3-0) in its march to the final. 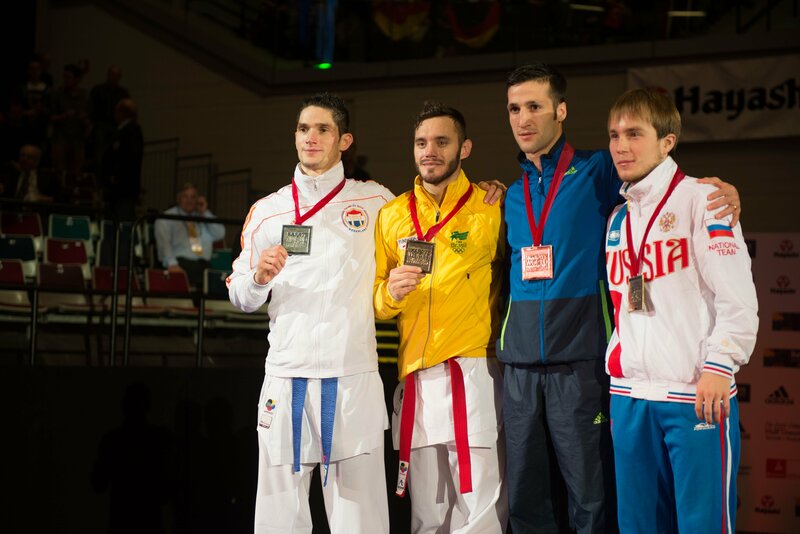 Iran’s Amir Mehdizadeh overcame Vitali Sementsov from Ukraine, and won the bronze medal in the men’s minus 60-kilogram weight category Kumite competition at OVB-Arena in the northern German city of Bremen. Brazilian athlete Douglas Brose defeated Geoffrey Berens from the Netherlands and won the gold medal in the weight class. 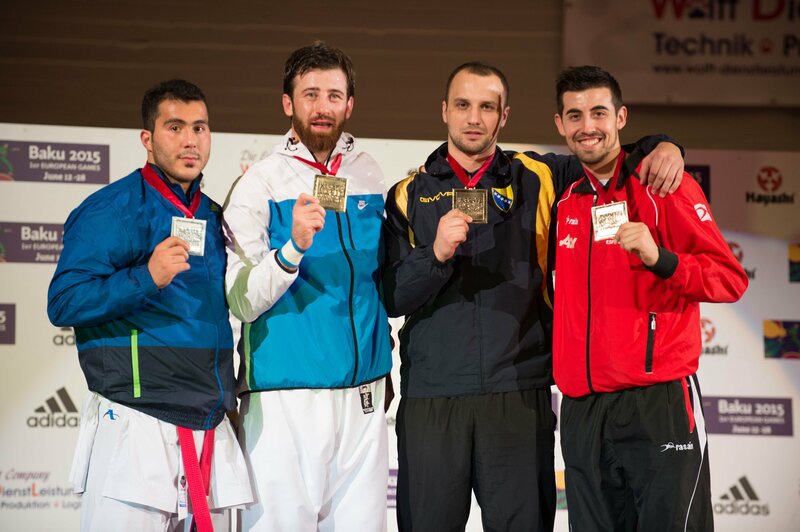 Iranian karate fighter Sajjad Ganjzadeh also lost to Enes Erkan from Turkey (5-4) on Saturday, and snatched a silver medal in the men’s over 84-kilogram weight class. Ganjzadeh overwhelmed a representative from Bosnia and Herzegovina in the semi-final contest. 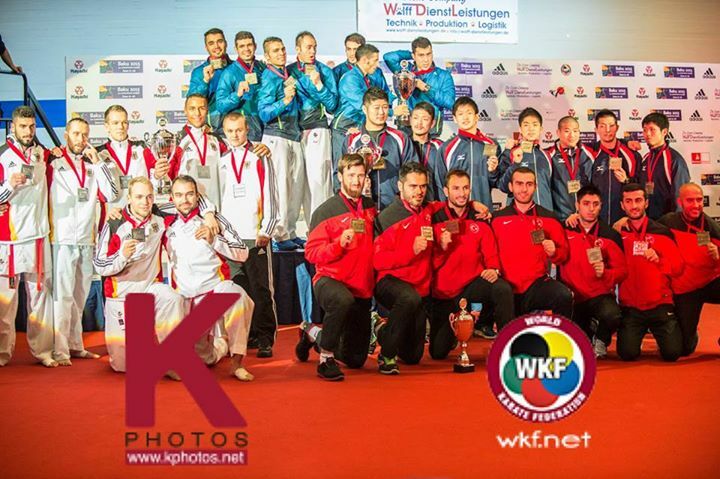 The 22nd edition of the World Karate Championships took place in Bremen, Germany from Nov 5 to Nov 9, 2014. 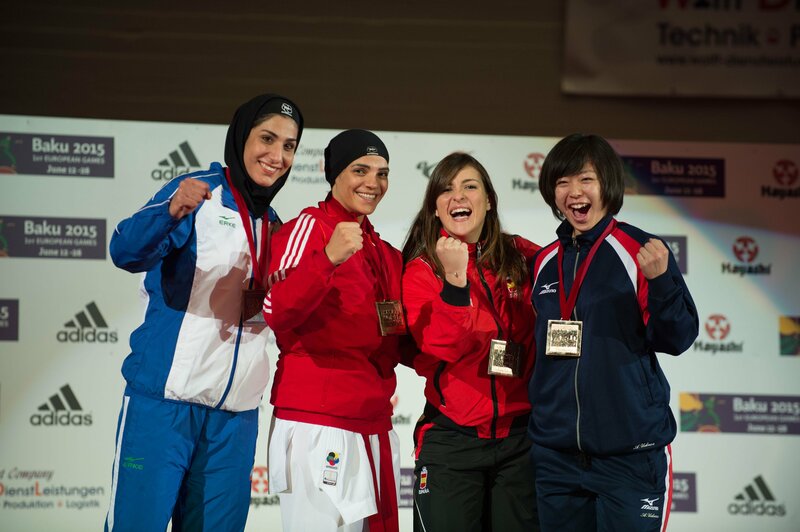 The tournament brought together 887 male and female athletes from 116 nations, including Argentina, Australia, Belgium, Brazil, China, Egypt, Germany, Iran, Italy, Mexico, Russia, Spain, Turkey and the United States. This entry was posted in Sports, Women and tagged sports, women on November 10, 2014 by socialinform.